The SuperBead filter system has evolved from the original Beadfilter, the mother of all other Beadfilter systems. Bead filtration goes back to the 80’s when professor Ronald F. Malone from the USA marked the begin of the Floating bead technology around today. These filters are well known under the name BubbleBead filters. The SuperBead filters are easy to recognise due to their sand glass shape. This Inovative shape is necessary to get a the very best laminar flow, in such a way that the floating Bead bed keeps steady. The Superbead traps the fine particules, enhancing the biological process of removing Ammonia and Nitrite. The Superbead filter can process large ammounts of koi food, as well as mechanicaly clean the pond water. This is achieved by utilising the useable surface area of the beads, 1300m2 from m3 of beads. The beads are cleaned and the dirt is removed quickly due to the inovative washing system without destroying the biomass covering the beads in the filter. To clean the beads simply turn the pump off and open the 3 inch slide valve, the dirty water will quickly be purged by a glugging action to waste. This technique is gentler making your biomass more active. The Superbead after cleaning holds no waste due to the unique shape without any dead corners to arbour any waste. One of the most under estimated factors in a Koi pond is the quantity of SS (Suspended Solids). This is the small ammount of food residues, koi faeces, algaes and other external factors which create Suspended Particules in your pond. A high level of Suspended Solids makes it difficult for koi to capture oxygen. The easier the breathing of a koi the healthier it will be. This is not only positive in the case of the koi's health but also the growth of your koi. These continuous Suspended Solids, consume alot of the available oxygen (O2) from the water, by way of removing all suspended particles before they disolve or convert, the water will stay in optimal condition. The Superbead removes these small suspended particles out of the water. 60 percent of all suspended particles from between 20 and 50 micron. 50 percent of all suspended particles from between 5 and 20 micron. The removal of TSS (Total Suspended Solids) during a one time pass of the pond water through the filter is 1 micron which is 0.001mm. The only way to influence the quantity of TSS is by changing the water flow through the filter. One of the biggest advantages of the SuperBead filter compared with other Beadfilter systems, is the required pump pressure. With a SuperBead filter it is recommended to use low pressure pumps like Red Devils or Sequence Pumps, even Aquamax Pumps. Many other systems need twice as much pump pressure to put the same amount of water through the filter. The pump capacity is directly related to the volume which a pump can deliver at one specific head of water. Head of water normally is given in meters or bar (1 meter head of water is 0.1 bar). There is a pressure loss (lose from head of water) over the filterbed (Beads) of approximately 0.01 to 0.05 bar (same as 10 to 50 cm head of water). Especially when the filter backwashes the resistance over the filterbed grows a little. This also has to do with the Total Suspended Solids in the pond. It is recommended to assemble a pressure gauge after your pump, this way you can see how much pressure there is after the pump. The SuperBead filter housing has a maximum pressure of 0.8 bar. Most of the pumps which are used in a koi pond do not reach this pressure level (1 bar is 10 meter head of water). It is also not very efficient to use such high pressure pumps and this makes the costs very high. 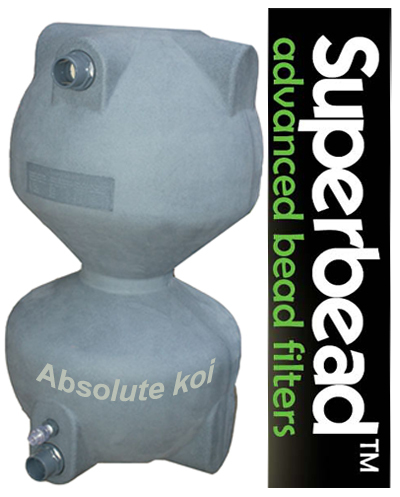 The SuperBead filter can be used above and below water level. The max resistance of SuperBead Filter is less than 0.1 bar (1 m head of water). The SuperBead filter doesn’t have any places where suspended particles pile up where anaerobic bacteria (pathogenic agents) originate. We have a customer using a Red Devil 17 Pump 3700 gph 155 Watt on the Superbead, the return back to the pond is 3300 gph!